CADSharp is pleased to announce that our industry-leading SOLIDWORKS API and SOLIDWORKS PDM API libraries are now available to CADSharp.com Power User members. This is the ultimate toolkit for those who want to speed up their .NET addin and stand-alone development by utilizing our hand-made library of commonly used functions and classes. Best of all, it’s regularly updated by CADSharp team members with great new functionality. Possibly the best way to demonstrate the power of this toolset is to compare two addins, one that uses CADSharpTools and one that does not. These addins both accomplish the same thing: creating dropdown menus in SolidWorks that appear in particular document types and display message boxes when clicked. You will notice that the example using CADSharpTools requires fewer imports, fewer classes, fewer lines of code (about a third less), and is much more readable. More importantly, you can imagine how much faster developing an addin is using CADSharpTools. You can set up your own template with CADSharpTools already utilized or quickly update old addins. 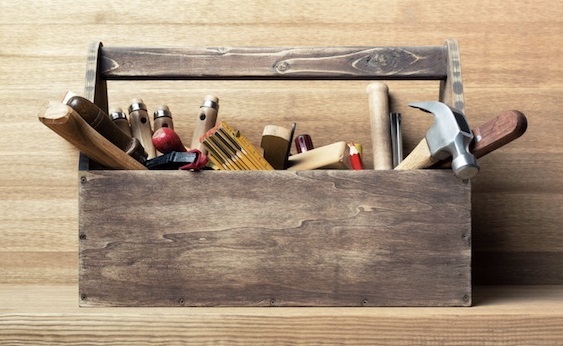 You might even discover a better way to accomplish certain tasks using our toolset. Note: While this is complete list of classes, the descriptions do not state all functionality in each class. Contains classes that let you easily create drop-down menus and CommandManager tabs (saving you possibly hundreds of lines of code), register and unregister your addin with SolidWorks, and perform “cleanup” when unloading the addin. Contains functions that let you rename components, get a component’s instance, get a component’s name without the instance number, and create an array of unique components in the assembly. Contains dozens of useful file extension and file filter constants. Lets you input your Document Manager license key via the constructor and then easily work with a document’s custom properties, get a document’s configuration names, and more. Provides flexible options for searching for and updating notes, getting a note’s position relative to the sheet margin, and locating views. Lets you store a spreadsheet’s contents in a .NET DataTable, get worksheet and workbook pointers, create Excel visibly or invisibly, quit Excel, and determine if any Excel processes are active. Lets you safely create, copy, delete, and rename files and folders in Windows. You can also determine if a file is read-only, verify its extension, verify whether a file name is legal, and read text files. Lets you sort ListView controls in ascending or descending order, as well as create file and folder browsers that add the browsed location to a text box. Lets you easily handle various aspects of logging, namely creating the log entries and accessing the log folder in the user’s AppData folder. Performs various tasks related to two or more SolidWorks model types, including toggling graphics updating, creating named views, working with display states, creating a pack and go, and saving the model (Save or Save As) in any format. Performs tasks related to parts, including getting IBody2 pointer given a body name, getting a body’s folder feature, and getting a body’s cut list feature. Lets you create an instance of a SolidWorks (for use with a stand-alone) with the ability to specify the desired year if multiple installations are present, exit SolidWorks (for use with a stand-alone), determine if any SolidWorks processes are active, open a SolidWorks model, get a model’s document type from its file path, and get a list of all SolidWorks models of a particular type in a folder. Lets you search geometry and topology, such as getting the length of an edge and getting the largest planar face in a body. Lets you easily get the data from a project’s Assembly Information, display a message with the product name as the title, save out an embedded icon to the local disk and get its file path, convert an enumerator to string, and compare two values given a tolerance. Lets you read read a specific XML node, update a specific XML node, and get a list of all material names in a SolidWorks material database. If you are a Power User member and wish to use CADSharpTools then you may visit our this page to learn how to obtain it. You can either download the DLL and add it as a reference to your project or you can copy and paste individual portions of the source code into your code. The documentation is available in the repository. You can also submit bug reports and enhancement requests using the repository’s built-in issue tracker. If you’re new to online repositories and have any questions, let us know. Want to keep up with future content and training events? Sign up for our newsletter. 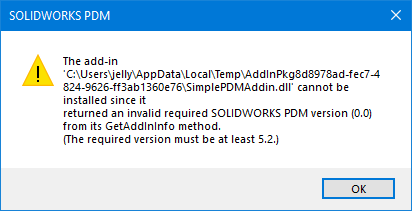 Have you ever attempted to develop a SOLIDWORKS PDM addin and run into errors when adding it to the vault? 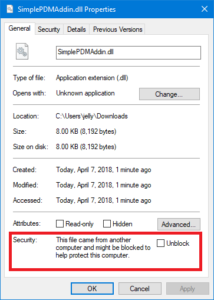 This short posts discusses four different types of errors one might actually see when adding a new PDM addin to a vault. Going to Project > Build (Compile for VB.NET) and then checking register for com interop. Your add-in class must implement the IEDMAddIn5 interface. To implement this interface, you must reference a dll that contains this interface. To target earlier version of the CLR, follow this link for instructions. This error is because of windows permissions. If you are running Windows 7/10, make sure the run the administration tool with administrator privileges. Questions or comments? Please share in the comments below! Want to keep up with future CADSharp.com content and training events? Join our newsletter! SolidWorks 2018 was released over half a year ago, but it’s never too late to talk about the new enhancements in the SolidWorks API. Aside from covering new API calls, we will look at what is undoubtedly this version’s most notable upgrade: VSTA 2015. This lets programmers create .NET macros in Visual Studio instead of the lackluster VSTA editor. Below is a list of the most notable API calls and interfaces added in SolidWorks 2018. You can see all additions and their related API calls in the Release Notes article in the API Help. You can find it in the local API Help by searching for “Release Notes” in the category tab. Note that the local API Help Release Notes will only be as up-to-date as the service pack you have downloaded. I have bolded those API calls that I find particularly interesting. Those with an asterisk I could not find when I looked at the release notes. Access general tolerance table annotations and features. Work with hidden cells, rows, and columns in tables. Add a distance mate between cylindrical components of an assembly. Add rebuild and save marks to multiple configurations and remove them from all configurations. Add specific display dimensions by type. Create a spline constrained to a surface. Create advanced assembly mates and sweeps. Create advanced holes in parts. Create bidirectional twist and thin-walled sweep features. Create internal and external threads. Handle pre- and post-notify events when converting bodies. Import and export Hole Wizard and Toolbox data. Modify control points and interior knots in sketch splines. Offload PhotoView 360 rendering to other networked machines. Optionally rebuild a model after adding configurations. Quickly check whether an interference exists between components. Set table anchors at selected sketch points on drawing sheets. Show the preview of a configuration selected in the ConfigurationManager. Get corresponding objects between drawing views and parts or assemblies. Get layer items by type. Get or set a custom property builder template for parts or weldments. Get or set whether to automatically rebuild equations. Get or set whether to automatically repair files on opening. New interfaces added this year not only have the typical accessor list you have come to expect but also a PDF that visually shows an interface’s accessors and the interfaces that it gives access to. At this point I don’t see myself using these very much, but perhaps others will find them helpful. VSTA (Visual Studio Tools for Applications) is the technology that allows you to create .NET macros. Previously you had to use the VSTA editor, which looked like a rudimentary version of Visual Studio but launched from SolidWorks like the VB Editor. I really despises the VSTA editor so I am pleased that creating .NET macros can now be done in Visual Studio. This change is possible because SolidWorks 2018 upgraded from VSTA 1.0 to VSTA 3.0 (also known as VSTA 2015). In the General tab of the System Settings, you can toggle between using VSTA 1.0 and 3.0 in 2018 and eventually only VSTA 3.0 will be available, therefore it is important to upgrade one’s .NET macros sooner rather than later. 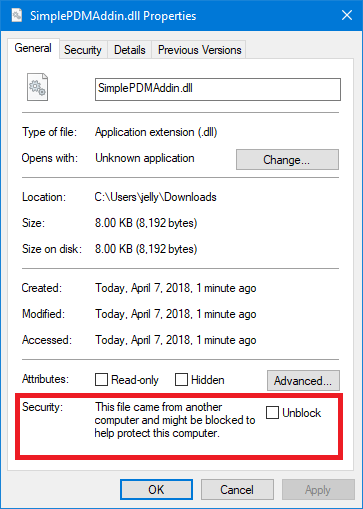 Personally, I am still going to avoid .NET macros because its unclear whether the DLL stability issue that existed with VSTA 1.0 still exists in VSTA 3.0. I also have encountered numerous people who can’t get VSTA installed properly even though it is checked in the SolidWorks Installation Manager. Altogether, the hassle involved with VSTA isn’t worth it and I’d rather simply use VBA macros for testing and .NET stand-alones and addins for production. Nevertheless, if you end up using VSTA 3.0 with Visual Studio then please share your experience with us in the comments below. According to the release notes: When you install SOLIDWORKS 2018, SOLIDWORKS and SOLIDWORKS enumerator context-sensitive helps are registered and integrated with the Help Viewer of the Visual Studio installed on your machine. After installing SOLIDWORKS 2018, configure Visual Studio to launch Help Viewer F1 help by selecting Help –> Help Preference –> Launch in Help Viewer. To be honest, I haven’t figured out how to use this with Visual Studio Community 2017. If anyone has gotten it to work, let me know in the comments below. At this point its unclear to me if this saves that much time beyond simply creating a shortcut to apihelp.chm. As the title says, SolidWorks Corp is no longer offering technical support for the Workgroup PDM API since Workgroup PDM is no longer shipped with SolidWorks as of this version. 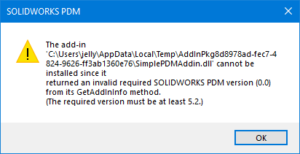 Obviously the intent is to push all PDM users, even the small and mid-sized companies that Workgroup PDM was created for, toward SolidWorks PDM Standard or Professional (formerly Enterprise PDM). Does anything we’ve covered stand out to you as particularly useful or exciting? If so then let us know in the comments!